Get ready to cross a ton of outdoor chores off your home improvement list with the SUN JOE iON SPX6000C-XR Cordless Pressure Washer. Only iON gives you the room to roam, courtesy of the powerful onboard, rechargeable 40V EcoSharp lithium ion battery, to take your cleaning tasks on the road - or anywhere power is at a premium. Perfect for the cabin, deck, boat, RV or a host of chores around the house, the innovative, top-loading detachable bucket design fills quickly with fresh water, or can be connected for continuous use with a garden hose. The self-priming pump provides superior performance and ease of operation, while iON's exclusive Pressure Select Technology lets you choose the perfect pressure to suit the cleaning task to tackle everything from siding to sidewalks, to porch and patio furniture, and much more. Simply select from among the four Quick-Connect tips or Soap Sprayer attachment to customize your cleaning results, and put the power of iON to work on your outdoor cleaning projects. iON 40V 5.0 Ah 1160 psi Cordless Pressure Washer Get ready to cross a ton of outdoor chores off your home improvement list with the SUN JOE iON SPX6000C-XR Cordless Pressure Washer. Only iON gives you the room to roam, courtesy of the powerful onboard, rechargeable 40V EcoSharp lithium ion battery, to take your cleaning tasks on the road - or anywhere power is at a premium. Perfect for the cabin, deck, boat, RV or a host of chores around the house, the innovative, top-loading detachable bucket design fills quickly with fresh water, or can be connected for continuous use with a garden hose. The self-priming pump provides superior performance and ease of operation, while iON's exclusive Pressure Select Technology lets you choose the perfect pressure to suit the cleaning task to tackle everything from siding to sidewalks, to porch and patio furniture, and much more. Simply select from among the four Quick-Connect tips or Soap Sprayer attachment to customize your cleaning results, and put the power of iON to work on your outdoor cleaning projects. iON 40V 5.0 Ah 1160 psi Cordless Pressure Washer is rated 4.1 out of 5 by 59. Rated 2 out of 5 by SnowBirdWPB from Seems like a really great product (and could be), but found a couple of challenges that make me r... Seems like a really great product (and could be), but found a couple of challenges that make me regret the purchase based on it's very high cost. Most critical - the battery life is terrible. It takes over 3 hours to charge and the first 2 charge ran for 3.5 hours on full power almost continuous use. The 2nd charge ran for 60 minutes. The 3rd charge for 30 minutes. Also, right out of the box it failed to run properly - turns out it commonly gets 'plugged' during shipping. Phone support was great though - the quick fix was to hook it up to the garden hose to use forced pressure to open up the plug. Problem is I didn't have a garden hose at that site (thus the whole reason for buying the unit). Great concept and runs well for the pressure I was looking for, but over-priced for very lousy battery. Rated 5 out of 5 by Anthony from This washer was easy to assemble, light and quiet. I am really satisfied with the battery life an... This washer was easy to assemble, light and quiet. I am really satisfied with the battery life and was able to use the washer for over 1 hours of heavy use without having to carry it. Excellent product. Rated 5 out of 5 by Michael from This is an excellent product. As advertised, this cordless unit... This is an excellent product. As advertised, this cordless unit offers portability and ease of use. This is important if you want to wash off the salt spots on your snow blower! Word of reminder when first set up, when attach water bucket to bottom unit, the bucket's water valve should protrude. Rated 5 out of 5 by Bubble from Awesome portable pressure washer for washing my vehicle. 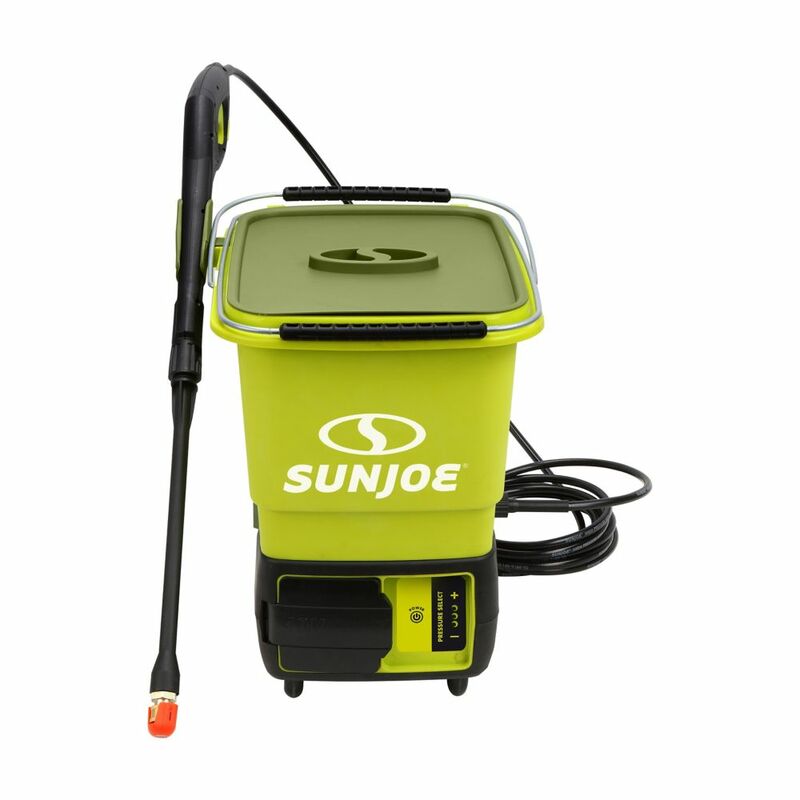 Awesome portable pressure washer for washing my vehicle.